Volkswagen Beetles displayed during the annual gathering of the "Beetle club" in Yakum, central Israel. Volkswagen says it will stop making its iconic Beetle in July of next year. 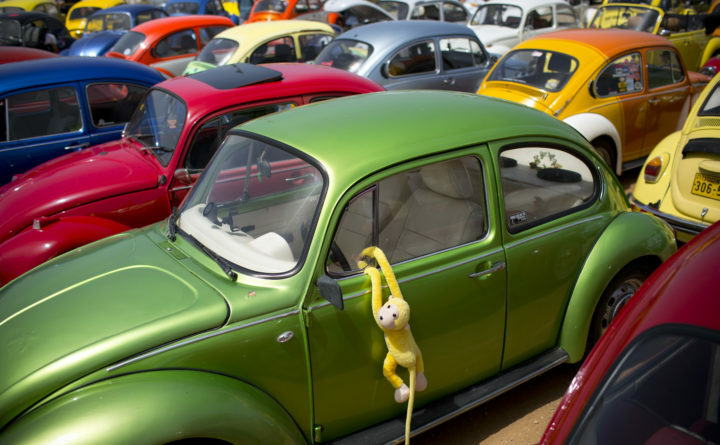 Volkswagen is ending worldwide production of its iconic Beetle, the model once so popular in North America that it prompted the German automaker to build its first factory on the continent in the 1960s. The last one will roll off the line from the company’s factory in the state of Puebla, Mexico, in July 2019. On Friday, Handelsblatt reported VW also plans to halt production for a week next month of the Golf at its huge factory in Wolfsburg, Germany. The model’s woes include more complex emission tests and plans to replace the current version of the hatchback. VW shares rose 0.6 percent to 141.62 euros at 9:34 a.m. in Frankfurt, giving a market value of 70 billion euros ($82 billion). Chief Executive Officer Herbert Diess has been a driving force behind this slimming down since he started leading the main VW car brand in 2015. Demand for the Beetle and other hatchbacks like the Golf has come under pressure as customer appetite has shifted toward sport utility vehicles. Beetle buying in the U.S. peaked the same year of the original Disney movie at about 423,000 units sold. The car became a phenomenon again in the 1990s when VW brought it back to America after a 20-year lapse. Last year, VW delivered just 15,166 units — less than one-seventh the sales of the Jetta sedan. SUVs, meanwhile, are capturing record share of the market. “The loss of the Beetle after three generations, over nearly seven decades, will evoke a host of emotions from the Beetle’s many devoted fans,” Hinrich Woebcken, CEO of Volkswagen’s U.S. sales unit, said in a statement.